Launched in February 1987, the Cambridge Computer Z88 (usually just called the "Cambridge Z88") was a Sinclair by any other name. 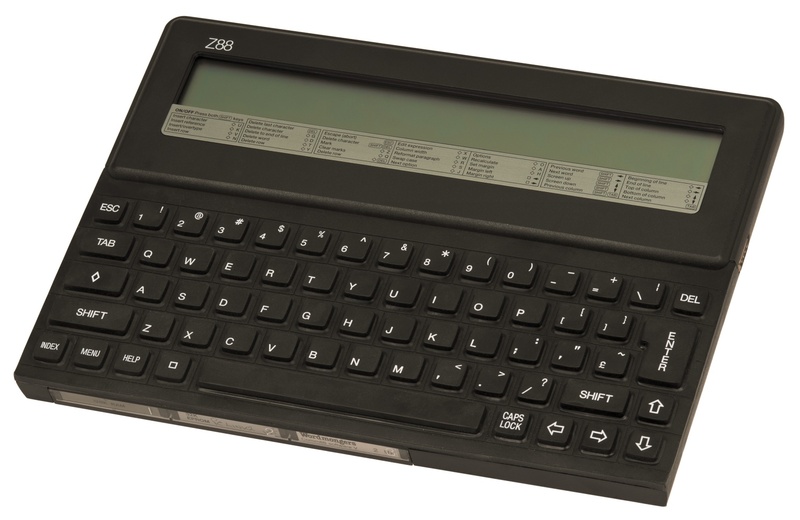 A compact, A4-sized ultraportable computer, the Z88 was a design success even if it didn't quite become the big seller that was hoped. In 1986, Clive Sinclair had sold the rights to the Sinclair name and product line-up (primarily consisting of the ZX Spectrum) to Amstrad. However, his company still existed under a different name and the Z88 was the product of long running research to produce a portable computer. As was typical for a high-profile 1980s product, the Z88 was announced a long time before it was available in quantity. First demonstrated in February 1987, it didn't really get to market in any quantity until 1988. And unlike previous Sinclair machines, the Z88 was something of a niche device targeting customers who wanted to do things on the move rather than sitting at a desk. Measuring 294 x 210 x 21mm the Z88 was the same size and weights as a pad of around 200 sheets of A4 paper. 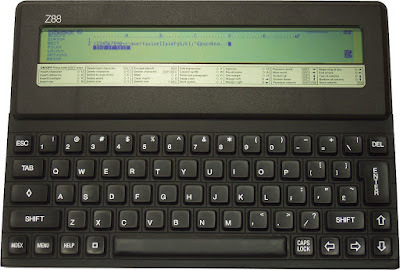 Most of the front of the Z88 was taken up by a large rubbery keyboard, and at the top was an 8-line 640 x 64 pixel STN LCD screen which was very advanced for its time. Underneath, the Z88 had a Z80 CPU running at 3.3MHz with 32K of RAM and it could store data on either volatile RAM cards or an EPROM card which wouldn't lose data when the machine was powered off. The Z88 was powered by four AA batteries which could give up to 20 hours use. The operating system was called Oz, and the Z88 came with BBC Basic, a terminal emulator, a word processor / spreadsheet application and some personal information management tools. Applications could be suspended and resumed, giving the Z88 a limited multitasking ability. New applications could be added through the EPROM slot, and data could be transferred to and from the Z88 using a serial cable. 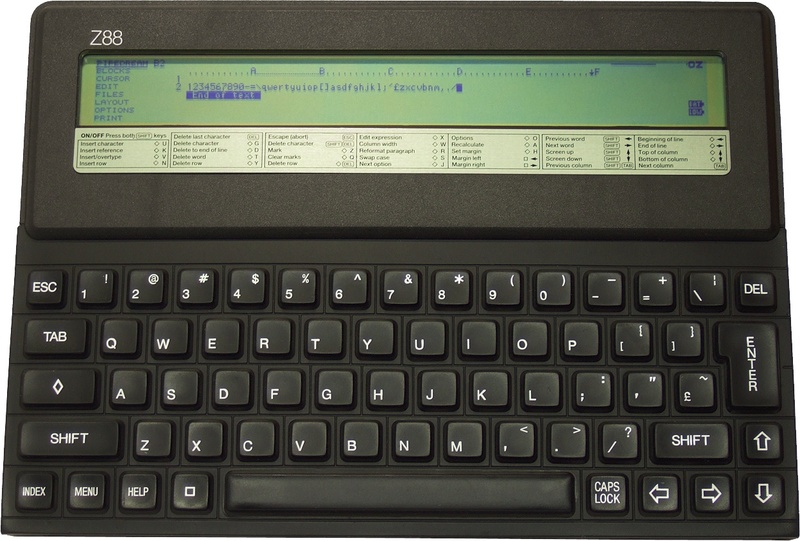 The Z88 found a particular niche as a note-taker. The large keyboard was effectively silent (unless the optional click was turned on), and the long battery life and readable screen certainly helped here too. But since the Z88 was a fully-featured 8-bit computer it could do many other things too. The Z88 became a bit of a cult machine, with after market upgrades to allow Flash memory storage and more RAM becoming available. Accessories and add-ons are still available as well. On the second-hand market the prices for the Z88 vary on condition and accessories, with UK prices ranging from around £50 to £130. In the end, the Z88 was probably too far ahead of its time. These days we are all used to carrying a computer about in our pocket, but thirty years ago it was a novelty. This was the last computer project from Sinclair's own company and although a variety of other projects were started at a later date they could never repeat the success that Sinclair had in the 1970s and 1980s.